Hostel Life : Why It's Amazing! Home >> Student Life >> Hostel Life: Why it’s Amazing! Going off to college often means trading the comfort of home and the coddling of our family for a different life altogether; one of compromise and adjustment, where we have to fend for ourselves. I am, of course, talking about life in a hostel. Most colleges have hostels you can stay in, and living in one is enriching, fun and frightening, all at the same time! At home, we have nothing to worry about. There’s always food around, and when there isn’t, our mom will probably make it for us. At the hostel, food has timings, and it’s never as satisfactory as “ghar ka khaana” (home food). Where we had an abundance of money at home and all we had to do was ask for it, we’re often broke in the hostel, because we burn through our allowance so fast that it’s embarrassing to ask our parents again! And of course, there is the most important: homesickness! Just the thought of staying so far from family and the comfort zone our hometown offers is ominous. But hostel life isn’t all bad. In fact, the pros often outweigh the cons here. It’s not just a fun experience to live with friends for several years; it also teaches us much more about life than any class or lecture ever could. So if you’re considering leaving your home I favour of a good college, here’s why you shouldn’t hesitate! When we first get into the hostel, we are shoved into a room with strangers and expected to stay with them for the next few years. At home, it was difficult to share and compromise with even our closest friends and siblings, and now we’re expected to share a not-too-big room with a bunch of strangers? Well, that’s the fun of it. We get to know complete strangers and learn to compromise and share with them. It’s amazing how quickly we adjust if we’re forced to, and the best way to learn anything is to dive headfirst into it. Every night is a slumber party! Once we get to know our roommates and they become our friends, well, every night becomes a slumber party! The sleepovers we used to die for at home are actually just another night spent in the room at the hostel. With no parental restrictions on when to sleep, it’s amazing how long conversations with our roommates can go on for. Staying up till 3 am talking about random stuff becomes almost normal when we’re in hostel. This may sound clichéd, but it’s true. Making friends is easy when you have no choice, and it’s incredible how quickly we get to know someone we’re living with. Just a few months, and you’ll feel like you’ve known your roommate for years. The long late-night conversations, complaining about the crappy mess food, sharing everything from books to shampoo, and the daily fight for the washroom are things that bring people close in a unforgettable and unbreakable way. Being away from home makes you realize that money is not in infinite supply, and actually having to visit the ATM teaches us the pain of being broke. When we’re not at home, we start to realize exactly how much we’re spending, and saying “I have no money right now” becomes normal towards the end of the month. Although it is our parents’ money we’re using, it’s our account which becomes empty every so often, and spending wisely is better than feeling the embarrassment of asking parents for money every few days. This teaches us to be careful much before we have to experience being truly broke when we start working. If you stay at a hostel and haven’t tried group study even once, you’re missing out. At home, group study wasn’t really an option because who would you study with? But in the hostel, we study together, we fail together, we die together. Group study is both fun and effective, because when one person isn’t in the mood, the others can be the motivators. At the same time, joking around and making songs together while studying is something one should never miss out on. Being a hostelite, introvert or extrovert, you can’t help but know a lot of people. Be it going to random seniors for help with studies or reference books, or making friends with your entire floor in the daily bathroom struggle, we can’t help making friends with the most unexpected people. Remember craving those rare outings where you’d go to a fancy restaurant with your family and eat “exotic” outside food? We get enough of that on weekends here. What we really miss is “maa ke hath ka khaana” (home cooked food). Going home means having traditional home food for us, and we are usually ready to eat even the things we didn’t used to like before, because it’s home food! We can probably eat the same thing for breakfast, lunch and dinner without getting bored, because we’ve been craving traditional home food for so long. Be it a shampoo or an iron, or even clothes to wear for a function, everything you need is probably just a knock away. In such a big hostel with so many girls, you’re bound to find someone your size who’d lend you clothes for a day. From things as small as a pencil or assignment pages, to clothes and matching jewellery, you won’t find yourself at a loss for anything at a hostel. And the college traditional day is the most fun, with girls lining up outside a friend’s room to get their sarees draped, and boys running around borrowing everything from cuff links to shoes from others. In the hostel, you’ll literally never be alone. Even if your roommates have gone off home, or maybe outside, there’s always a hundred other people whose room you can go to, to just talk about random stuff. Living with friends makes us forget what it’s like to be alone, and this is something you’ll certainly miss when it’s time to graduate. Hungry and have nothing but a kettle and water? Someone is likely to have Maggie, and even if it takes more than 2 minutes to make Maggie in a kettle, well, you won’t be hungry anymore! It’s amazing how much you can do with just a kettle and no stove or anything fancy. From making Maggie to boiling eggs, to even enjoying kheer, a little desperation and presence of mind teaches you to do wonders with virtually no resources! Hostel life has its ups and downs, but in the end, even the problems we face and things we always complain about become stuff we’ll miss when we leave college. So make the most of your hostel life, because the memories and friends you make while there will last for life. 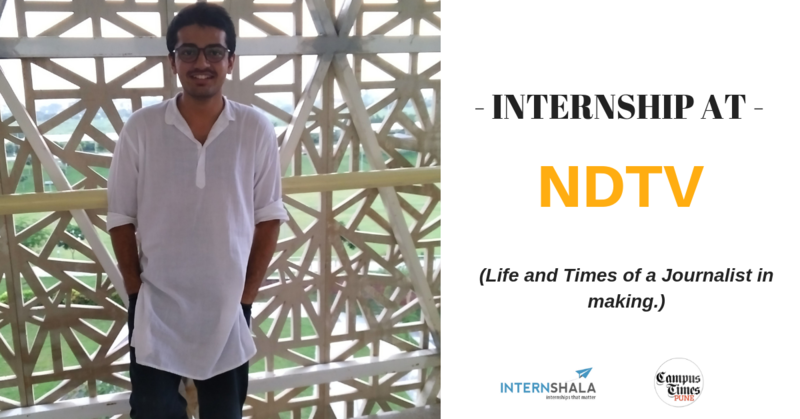 Rohan Parikh, a student of Ashoka University shares his experience of interning at NDTV and how it fueled him to pursue a career in Journalism.